Submitted 1 year 4 months ago by Maja Wrzesien. 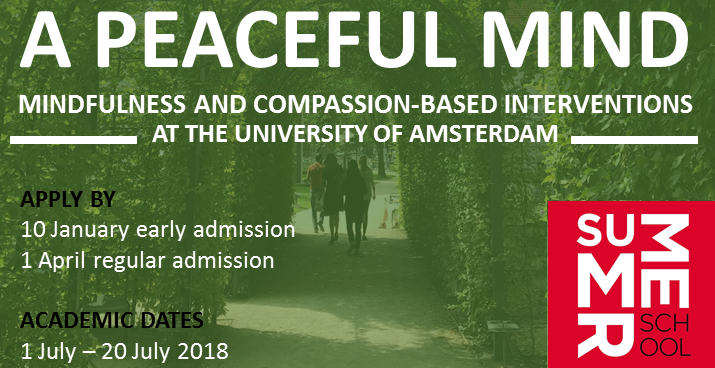 As an academic director I am very happy to invite you to apply for the 3-week UvA Summer School: "Peaceful Mind: Mindfulness and Compassion-Based Interventions". This summer programme provides an overview on the topic of emotion regulation and contemplative practices such as mindfulness- and compassion-based interventions, as a part of H2020 Marie Sklodowska-Curie Actions founded project (Peaceful Mind: 656333). For early admission please apply by January 10th, for the regular admission apply by April 1st. For more details: uva.nl/summer-mindfulness or summer-info-gsss@uva.nl.